One of the many benefits of moving to a senior living community in Saratoga Springs is access to public transportation. The Wesley Community is conveniently served by the CDTA Bus Route 452. A bus stop at the Embury Senior Apartments provides Wesley residents with service to Skidmore College, Wilton Mall, Walmart and Downtown Saratoga’s many shops and restaurants. Seniors and those with disabilities pay a reduced fare of just $0.75 per ride. 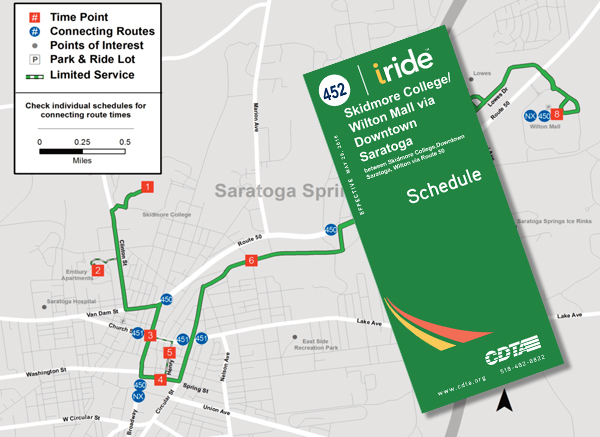 Download a PDF of the Bus Route Map & Schedule and visit the CDTA website for the most up-to-date Fare information.